Click here to learn more about this special offer. Restrictions apply. The EOS C700 offers the option of two different sensor designs. The EOS C700 offers a 4.5K CMOS sensor with 15 stops of dynamic range. The standard sensor will be offered in both PL and EF mounts. The EF mount version of the camera features Dual Pixel CMOS AF Technology. The EOS C700 GS PL features global shutter technology. Global shutter technology is helpful for sports, fast action, concerts and events where it eliminates "jello" and "flash band" artifacts. The image on a global shutter sensor is captured simultaneously by every pixel on the sensor. 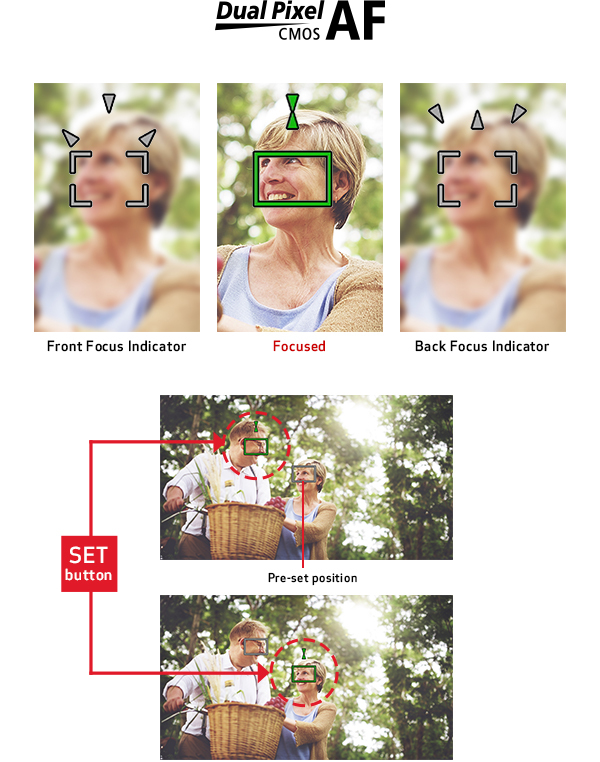 Standard CMOS sensors capture the image by scanning the scene from top to bottom. Depending on the speed of the scan, the time delay between the scan of the first line and the last sometimes results in a "jello" effect where straight lines appear curved or wobble as the camera or subject moves. By capturing the entire image at once these artifacts are removed. The EOS C700 GS PL features 14 stops of dynamic range and does not offer Dual Pixel CMOS AF. The EOS C700 features a new design when compared to previous Cinema EOS products. The EOS C700 is a full size cinema camera allowing for both traditional studio style and handheld configurations. The camera body includes built in cheese plates with numerous 3/8-16 and 1/4-20 threaded holes on the top and bottom to easily attach accessories. The top handle attaches in a variety of positions for assisting in achieving optimum balance. The EOS C700 has an optional 0.7-inch OLED Electronic Viewfinder (EVF-V70). Canon's first professional grade viewfinder features Full HD 1920x1080 viewing, surround view, view assist and false color. The EVF also has the ability to display an HDR simulated picture with a "stretched" dynamic range for increased shadow detail and highlight retention. The EOS C700 can be used with an optional accessory Shoulder Support Unit SU-15 with industry-standard rosettes on each side and 15mm rods in front. The unit has a comfortable shoulder pad that consists of two sections that can adjust to fit the width of a camera operator's shoulder. Attaching the shoulder pad to the camera allows for easy handheld operation and still provides a quick release bottom to connect to a tripod. The EOS C700 has a significantly upgraded power management system to help facilitate connecting with various third party accessories. The camera comes standard with a V-mount plate to accept common professional battery systems. External power supplies of +10 - 34 VDC plug into the camera via an industry-standard 4-pin XLR Style power connector. Camera accessories can be powered via a 24V DC 3-pin and a 12V DC 2-pin connector located on the front of the camera to help with cable management. The EOS C700 offers a choice of two lens mounts, PL or Cinema Lock EF. 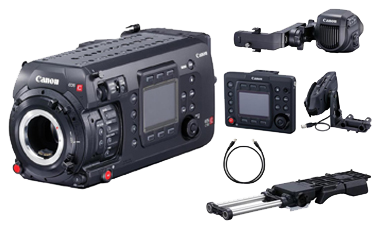 The Canon Cinema Lock EF mount is the same ruggedized version first seen on the EOS C300 Mark II. With an optional Codex CDX-36150 attached, the EOS C700 can record uncompressed 10-bit or 12-bit 4K RAW up to 120 fps, 2K RAW up to 240 fps, or ProRes 4K up to 60 fps. 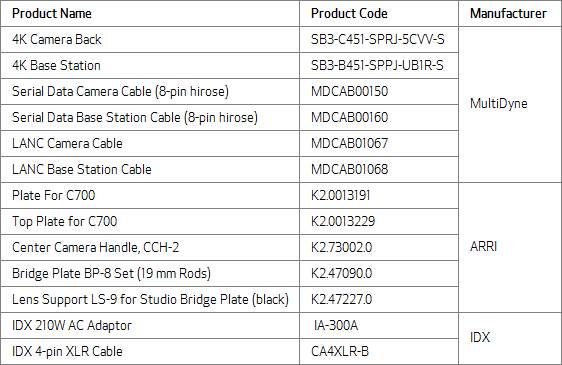 The Codex CDX-36150 is made specifically for the EOS C700 and attaches to the rear of the camera and is controlled directly through the cameras menu system. The Codex CDX-36150 RAW Recorder is attached to the EOS C700 by removing the battery plate at the rear of the EOS C700 and replacing it with the recorder. This modularity of the EOS C700 allows the recorder to be connected securely without wires and act like an integrated part rather than an external accessory. The rear of the Codex recorder has a battery plate with onboard Gold Mount battery connector. External power (10-32 VDC) can also be supplied to the 2-pin connector on the recorder body. Codex CDX-36150 is an integrated system when attached to the EOS C700. The Codex Recorder allows recording not only 4K RAW, but also ProRes at significantly higher frame rates than internal CFast Cards. When recording RAW files are saved as a .RMF frame sequence in an uncompressed format with no "baked in setting." Clip development can then be easily adjusted in post using the included Canon Raw Development (CRD) software. 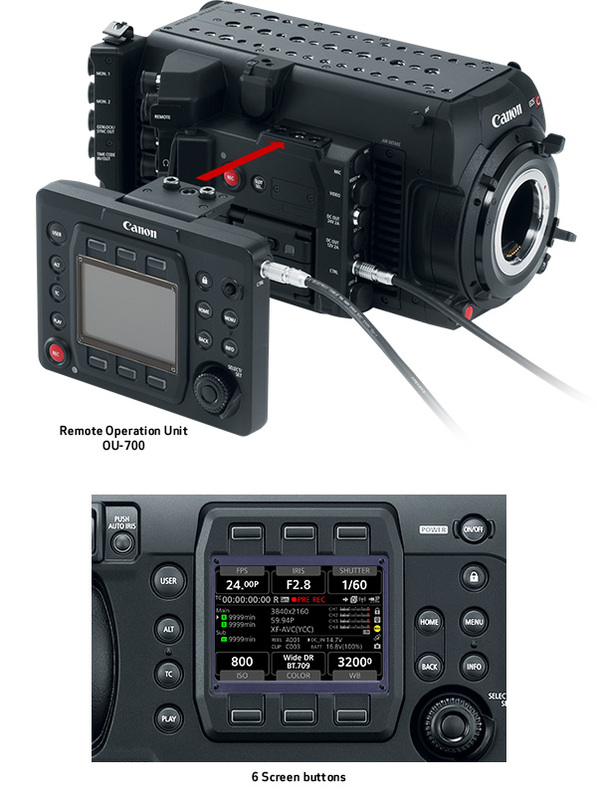 The EOS C700 has two modes of internal recording: Canon XF-AVC and Apple ProRes. Both record to internal CFast Media. XF-AVC records up to 59.94p in 4K onto the CFast media. The camera also records Apple ProRes to CFast media. This is the first time a Canon Cinema EOS camera records ProRes internally. This can help significantly reduce the time and cost of transcoding video files for productions using ProRes as an intermediate and delivery format. Simultaneous dual CFast recording is available for creating an immediate backup. 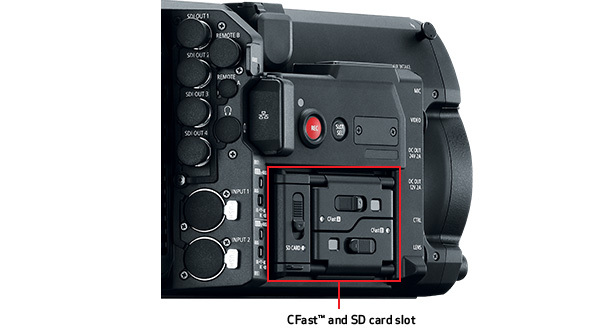 The EOS C700 features two CFast 2.0 card slots on the camera right side and one SD card slot. The EOS C700 can record XF-AVC and ProRes (along with metadata) simultaneously to either or both CFast cards. Simultaneous recording is helpful, for example, where one card might go to the post house and the other could be stored safely in the production company's archive. Relay recording is also possible for situations where changing cards and losing precious seconds is not an option (sporting events, speeches, nature documentaries). At the same time, an 8-bit 4:2:0 Proxy XF-AVC file can be recorded to the SD card for immediate editing. The SD card can also capture JPEG still frames (2048x1080 or 1920x1080), metadata, menus and other information. The EOS C700 supports Canon Log 2 and Canon Log 3 Gamma. Canon Log is designed to reproduce, in post production, the entire tonal range that the CMOS image sensor is capable of. Log workflow provides the user with higher dynamic range, more highlight and shadow retention, and more flexibility in grading. Canon Log 2 provides the largest dynamic range and image detail. While Canon Log 2 provides the most post-production flexibility and the full 15 stops of dynamic range of the sensor, it requires more post time. 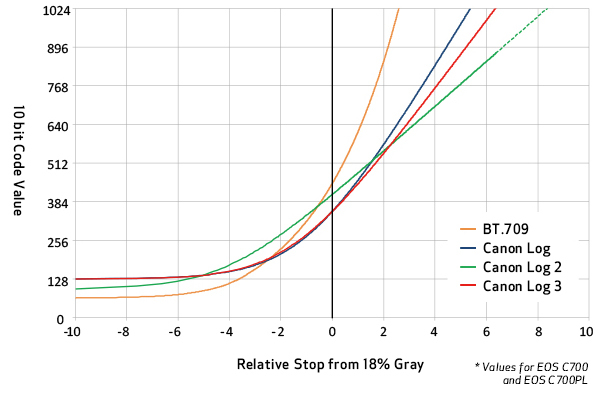 For users looking for most of the benefits of log workflow, but with shorter turnaround times, Canon Log 3 provides an alternative with only a slightly reduced dynamic range of 14 stops. The EOS C700 features the option to output ST 2084 over the monitor port to assist in HDR production. ST 2084 allows compatible monitors to simulate the HDR look of the final piece allowing for easier lighting and other technical decisions on set during the acquisition process. The optional Canon Electronic Viewfinder (EVF-V70) also allows for a ST 2084 simulation mode to allow the camera operator to see HDR visuals close to what is supplied on the monitor signal. This can further facilitate creative decisions on set where HDR reference equipment and output devices might not be available. The EOS C700 supports Rec. 2020, which is the UHDTV display color space. Rec. 2020 support means that production looking to go straight to the UHD format can start in that expanded color space without the need to do conversions. 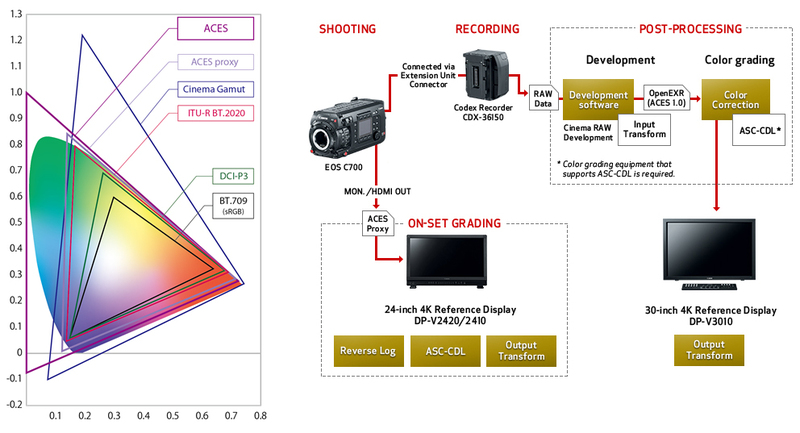 The EOS C700 supports ACES 1.0 of the Academy Color Encoding System. Using Canon supplied IDTs, images captured on the EOS C700 can be imported directly into the ACES compatible systems. Additionally, video output from the camera can be monitored by selecting the ACES Proxy. Aces Proxy allows the camera to send a monitor output that simulates ACES space to a compatible monitor or device. Modifications made using the proxy output can be saved and later brought into the editing or grading suite to help insure changes and color choices made on set are accurately reproduced in post. Canon 17, 24 and 30-inch Reference Displays support ACES image display. 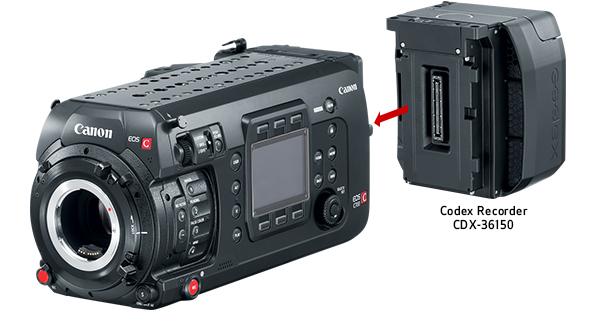 The EOS C700 has four 3G-SDI outputs at the rear of the camera. So, while the Codex CDX-36150 records 4K RAW, the EOS C700 can simultaneously send the 4K image to a Canon Reference Display. The Canon Monitor debayers the RAW image and converts it to an ACES color space. In addition to ACES, Canon's new DP-2420 Reference Display nicely supports HDR, Canon Log3 and Hybrid Log Gamma. "DIGIC" is Canon's acronym for Digital Imaging Integrated Circuit. The EOS C700 uses three DIGIC DV 5 processors to power the advanced features of the camera. DIGIC works in conjunction with other subsystems of the camera such as the lens and sensor to support the various features and the image processing engine. The EOS C700 features in-camera ND filters to help save production time and help increase shooting versatility without the need to change filters. The internal ND filters are selected with the ND FILTER + and - buttons on the left side of the camera. 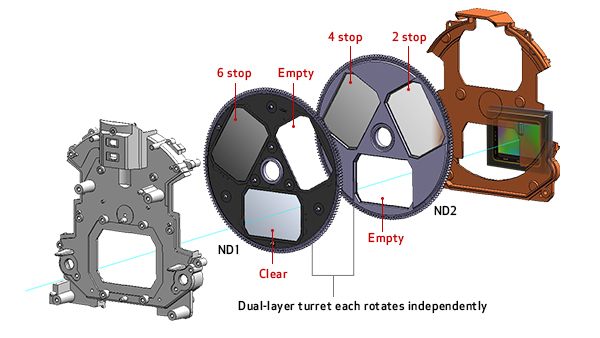 The EOS C700 uses an internal, motorized ND assembly consisting of two rotating disks with glass ND filters between the rear of the lens and the front of the sensor. This combination of ND filters allows 2, 4 and 6 stops of ND in normal mode and 8 and 10 stops in extended mode. The EOS C700 supports anamorphic format lenses by electronically desqueezing the image in the viewfinder and on connected monitors for viewing. On the sensor users can take advantage of the camera's full 4K resolution by using 1.3x squeeze anamorphic lenses that cover the full 16x9 area of the EOS C700 sensor. 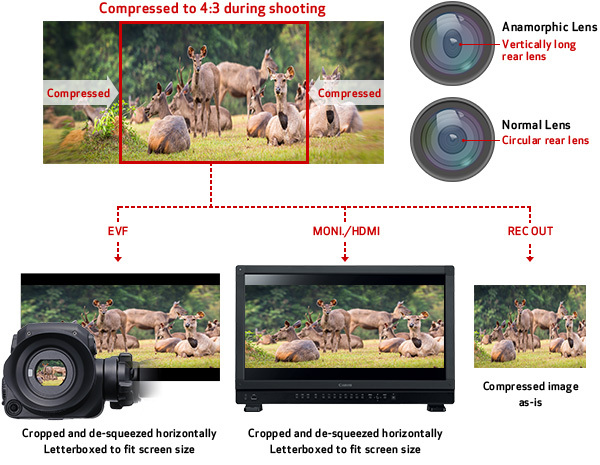 Popular 2x squeeze anamorphic lenses that cover a native 1.2:1 aspect ratio on the sensor can be used as well using a cropped area of the sensor. Two B4 mount adapters are available for the EOS C700, B4 to EF adapter (MO-4E) and B4 to PL adapter (MO-4P). Canon's B4 mount adapter blows up the image slightly, resizing the 2/3" image circle to approximately 1" to correspond with native HD resolution on the EOS C700 sensor. This design helps minimize light loss through the adapter, while maintaining depth of field and range of the 2/3" lens. For power and control with B4 servo lenses the C700 features a 12-pin lens connector on the front of the camera body. IP Streaming enables users to send their video online, in real time, as they shoot. It works with compatible IP decoders, IP streaming software and other devices for live streaming to video websites, news shows, video productions, post production facilities, editing rooms and broadcast stations. The EOS C700 supports MPEG2-TS with UDP, RTP, RTSP+RTP protocols. The EOS C700 can connect to a wireless network using a Canon wireless file transmitter (WFT-E6A / WFT-E8A). Using the WFT Transmitter, users can operate the camera and view live images using a Wi-Fi® connected device with a compatible web browser. When an optional Canon GP-E1 GPS receiver is connected to the EOS C700, GPS information can be added to the metadata. This is selected using the menu. GPS position (altitude, latitude, longitude) and time can be recorded where GPS service is available. Canon's RC-V100 Remote Controller plugs into the EOS C700 via an RS422 connector on the rear panel. This optional accessory allows image quality adjustments and camera operations to be set from a distance. 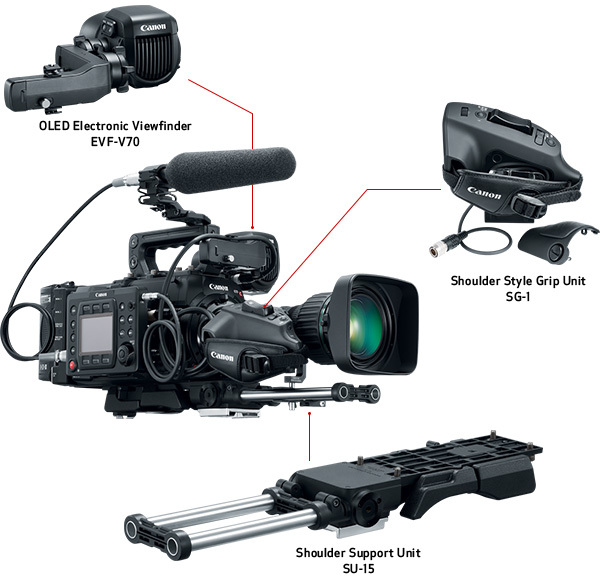 Viewfinder EVF-V70, Remote Controller RC-V100, Shoulder Support Unit SU-15, Remote Operation Unit OU-700, Shoulder-Style Grip Unit SG-1, GPS GP-E1, Wireless File Transmitters WFT-E6A / WFT-E8A. IEEE 802.11n/11a (5 GHz band): Differs depending on the model’s destination. The Wireless File Transmitter WFT-E8A adds impressive wireless operation and speedy image transfer to the EOS-1D X Mark II camera. Featuring fast communication speed, expanded versatility and an enhanced user interface, the WFT-E8A not only boasts incredible speed, but also streamlines wireless photography configurations whether in the studio or on location. Supporting IEEE 802.11ac wireless protocol using both 2.4 GHz and 5 GHz bands for high-speed image transfer, the WFT-E8A also features comprehensive smart device connectivity and numerous camera linked shooting options for advanced photography and movies. It's an ideal complement to the speed and power of the EOS-1D X Mark II. Canon's new Cinema EOS C700 Digital Cinema Camera is designed to be a flexible “A” camera for any type of shooting scenario. The EOS C700 features both internal 4K ProRes and XF-AVC recording. Designed with ACs, DITs and operators in mind, this video covers many aspects of operating the C700, including data and power management. Join Canon's Brent Ramsey on set with Cinematographer Russell Carpenter, ASC and Canon Explorer Of Light Tyler Stableford for the first U.S. based EOS C700 shoot. Join Canon's Brent Ramsey along with Cinematographer Russell Carpenter, ASC and Canon Explorer Of Light Tyler Stableford as they wrap day 1 of shooting in Carbondale, Colorado. Join Canon's Brent Ramsey on set with Cinematographer Russell Carpenter, ASC and Canon Explorer Of Light Tyler Stableford for the first U.S. based shoot with the EOS C700. Canon Senior Product and Sales Trainer, Loren Simons discusses the EOS C700.